Crime and violence come with a high price tag, especially for Latin America and the Caribbean (LAC). The Inter-American Development Bank estimates the direct cost of crime and violence in LAC countries is over $260 billion each year. That is to say, Latin America spends 3.6 percent of its GDP on crime-related costs—which include social costs due to imprisonment and victimization, private expenditure on security, and public spending on policing, administration of justice, and incarceration—matching the amount devoted by the region to infrastructure. 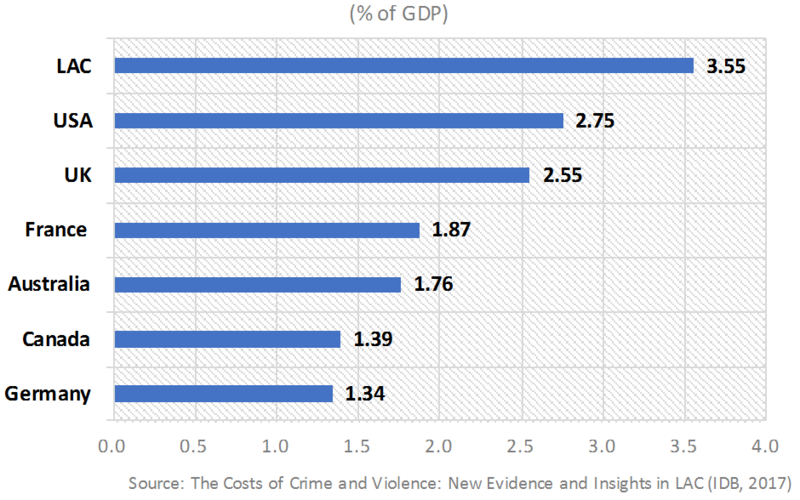 As shown in Figure 1, mean crime-related costs are significantly larger in LAC than in developed countries. Towering homicide rates account for the lion’s share of the social costs of crime (i.e., the income forgone by both victims and imprisoned offenders). Experts note that 33 percent of global murders happen in LAC countries, despite the region being home to just eight percent of the world’s population. Of these deaths, more than 75 percent occur in Brazil, Colombia, El Salvador, Guatemala, Honduras, Mexico, and Venezuela. In other words, one in four global murders take place in these seven LAC countries. What accounts for the remarkable concentration of global murders in Latin America? A substantial chunk of the direct costs of crime and violence in these countries can be attributed to organized youth crime. Criminal organizations like drug cartels in Mexico (e.g., Cartel de Sinaloa, Los Zetas) and Brazil (e.g., Comando Vermelho, Primeiro Comando da Capital), neo-paramilitary groups in Colombia (e.g., Clan del Golfo, Los Rastrojos), and street gangs in the Northern Triangle (e.g., Mara Salvatrucha, Calle 18) offer lucrative opportunities for children, teenagers, and young adults, in particular those who neither work nor go to school. There are 20 million of these so-called “ni-nis” in LAC—a term that comes from the expression “ni estudian, ni trabajan,” Spanish for those who “neither study nor work.” These marginalized urban young men not only derive income from crime, but also find a much-needed sense of community identity and belonging in these criminal organizations. In a recent study with Thierry Verdier and Yves Zenou aimed at understanding the role of leaders in juvenile crime, we present a novel theory in which experienced criminal leaders transmit criminal best practices and act as mentors to younger offenders. This theory models criminal decisionmaking in two different stages: First, each individual decides whether to become a criminal or not; then, if the person chose to become a criminal, she must decide how much crime to commit. This simple theoretical model relies on two key assumptions. First, the expected value of the plunder obtained by a criminal depends positively on her ability to commit crime, which in turn is a function of the criminal best practices learned from more experienced leaders within the criminal network. While leaders impart knowledge and skills to all novice offenders in an organization, the intensity of learning is inversely proportional to the social distance between the young offender and the leader. In other words, offenders who are more closely connected to a leader are able to receive better criminal training than those further away in the organization, and can therefore expect to earn higher proceeds from crime. Second, young offenders aim to fit in with their peers by imitating the behavior of more experienced leaders, such that the closer an offender is to a leader, the higher her willingness to imitate the leader’s behavior. In other words, young offenders face a social cost from failing to conform to leaders’ criminal behavior, and this cost increases with proximity to the leader within the organization. Given these two assumptions, our framework predicts that the social distance between a youngster and an experienced criminal leader affects both the former’s decision to become a criminal as well as the number of crimes she commits. To test the empirical relevance of our theory, we use data from the National Longitudinal Study of Adolescent to Adult Health, which contains detailed information on social networks and juvenile delinquency for a representative sample of students attending high schools in the U.S. in 1995. Our results are in line with the theory. We find that youths who are further away from a criminal leader not only have a lower probability of becoming criminals, but also commit fewer crimes. Interestingly, the model also suggests that a criminal leader can have an effect on youths’ criminal behavior at as many as four degrees of separation. Some of the policy implications of this study could be relevant to crime prevention and control in violence-torn areas of LAC. In order to get an idea of the potential effectiveness of interventions based on these insights, we simulate the effects of a policy that removes all criminal leaders from every high school, find that it reduces average crime by 20 percent and lowers the individual probability of becoming a criminal by about 10 percent. 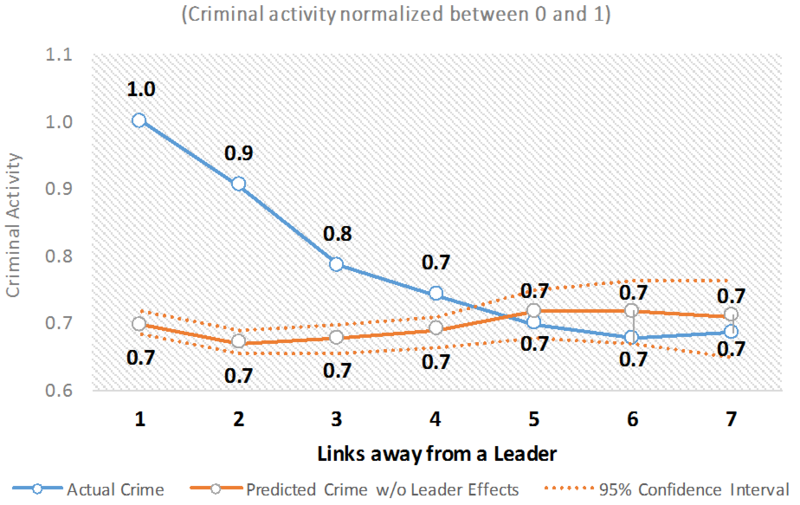 As expected, the policy is more effective at reducing the criminal behavior of those youths who are the closest to an experienced leader: individuals one and two steps away from a leader commit 30 and 26 percent fewer crimes when the leader is removed from the network (see Figure 2). In light of the prominence of organized youth crime in Latin America and the Caribbean, our study suggests that interventions targeting experienced criminal leaders could have sizable effects on aggregate crime and violence in the region.